Since the discovery of Mars in 1659 we have wondered if life once inhabited the red planet. NASA’s rovers most recent images have enthusiasts really excited, check out these stones that appear to have ancient engravings on them. IMAGE: HARRY BURTON (C) THE GRIFFITH INSTITUTE, OXFORD. 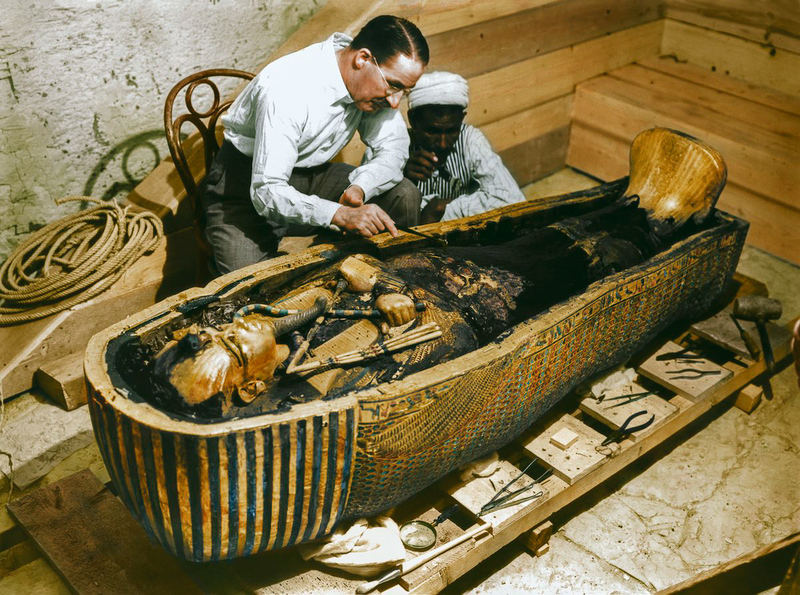 COLORIZED BY DYNAMICHROME FOR THE EXHIBITION “THE DISCOVERY OF KING TUT” IN NEW YORK. 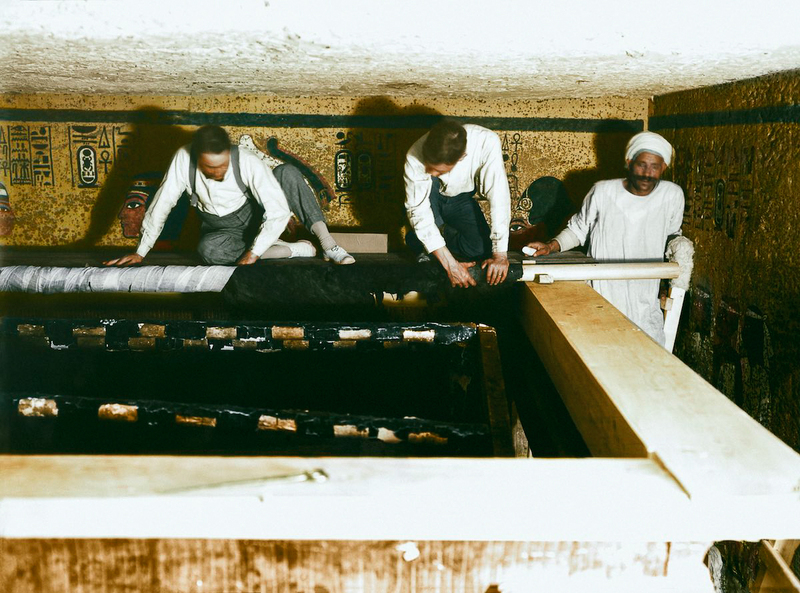 Howard Carter, Arthur Callender and an Egyptian worker open the doors of the innermost shrine and get their first look at Tutankhamun’s sarcophagus. In 1907, Egyptologist and archaeologist Howard Carter was hired by George Herbert, the 5th Earl of Carnarvon to oversee excavations in Egypt’s Valley of the Kings. 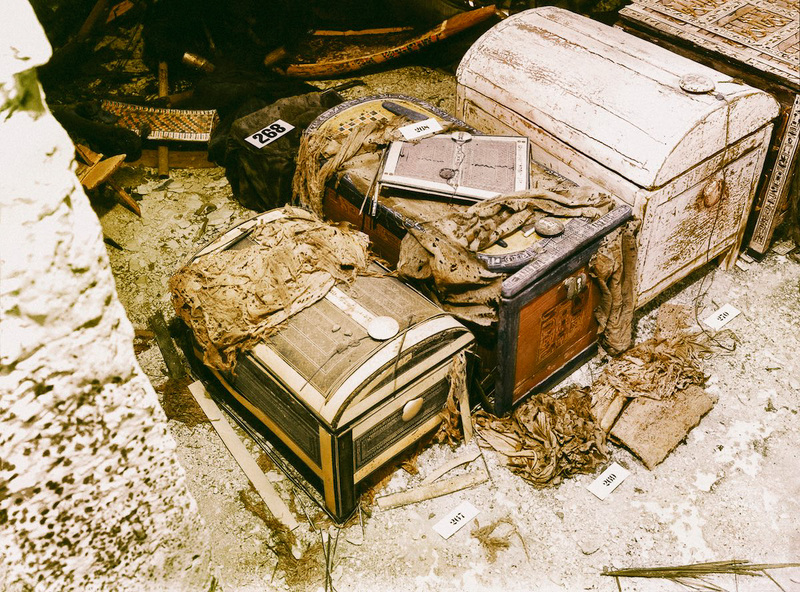 Carter had built a reputation for scrupulously recording and preserving discoveries. Carter searched the valley for years with little to show for it, which drew the ire of his employer. In 1922, Lord Carnarvon told Carter that he had only one more season of digging before his funding would be ended. Revisiting a previously abandoned dig site at a group of huts, Carter started digging again, desperate for a breakthrough. On Nov. 4, 1922, his crew discovered a step carved into the rock. By the end of the next day, a whole staircase had been uncovered. Carter wired Carnarvon, imploring him to come at once. On Nov. 26, with Carnarvon at his side, Carter chipped open a small breach in the corner of the doorway at the end of the stairs. Holding a candle, he peered inside. At first I could see nothing, the hot air escaping from the chamber causing the candle flame to flicker, but presently, as my eyes grew accustomed to the light, details of the room within emerged slowly from the mist, strange animals, statues, and gold — everywhere the glint of gold. 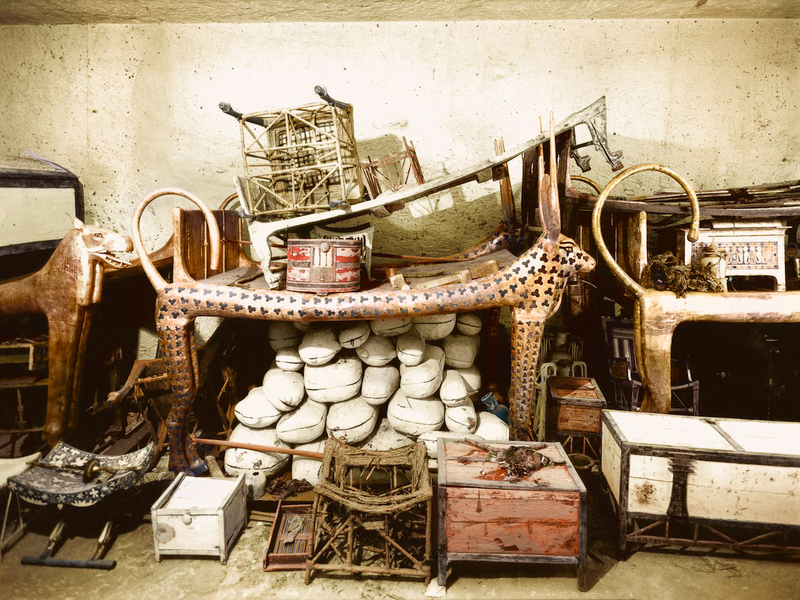 A ceremonial bed in the shape of the Celestial Cow, surrounded by provisions and other objects in the antechamber of the tomb. 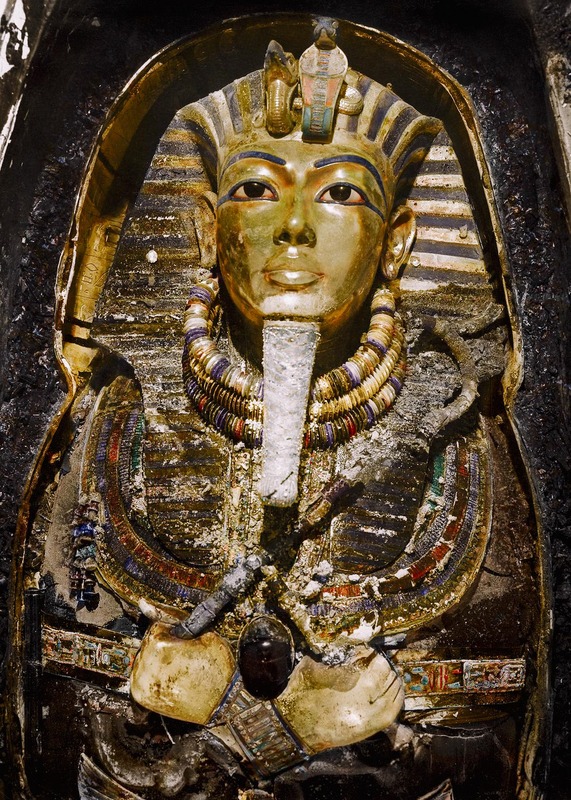 The team had discovered the tomb of Tutankhamun, the boy king who ruled Egypt from about 1332 to 1323 BC. Though there was evidence the tomb had twice been raided by ancient grave robbers, it was still remarkably intact. 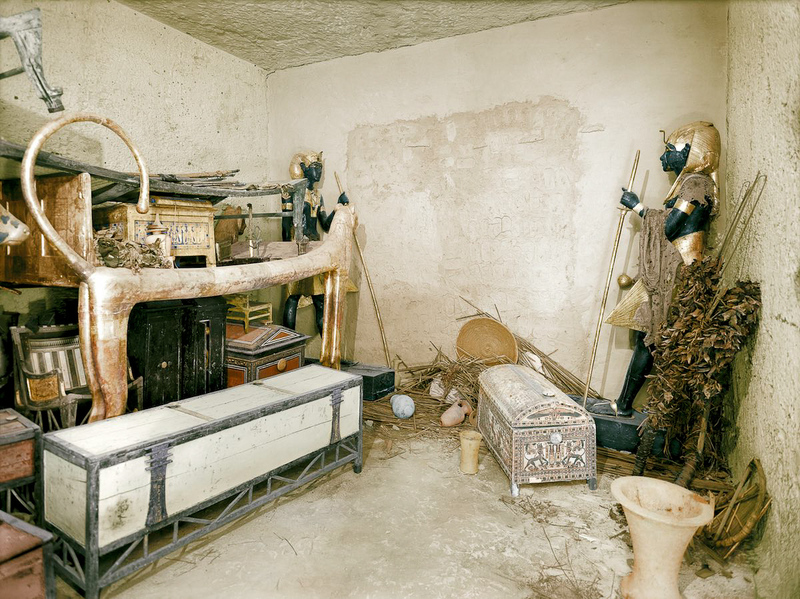 The tomb was crammed with thousands of priceless artifacts, including the sarcophagus containing the king’s mummified remains. Every object in the tomb was meticulously recorded and cataloged before being removed, a process that took nearly eight years. 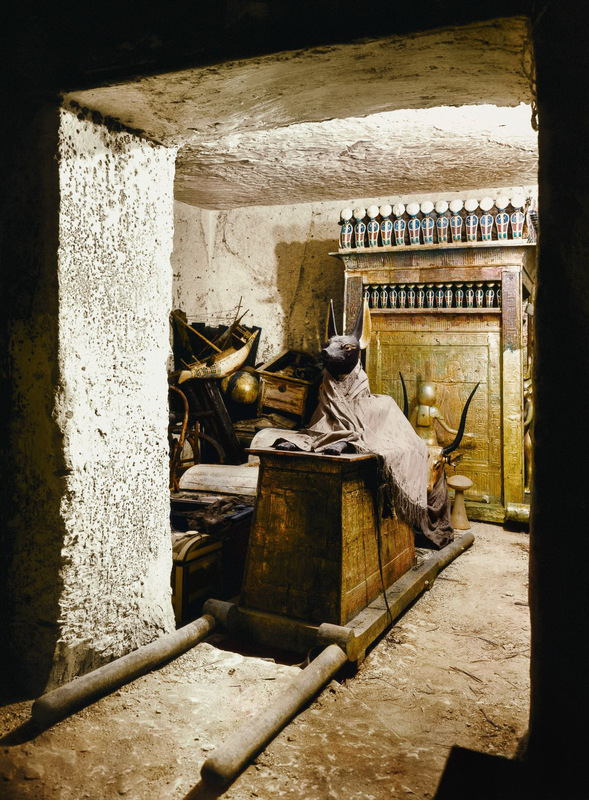 These photographs documenting the discovery of the tomb have been colorized by Dynamichrome for the exhibition The Discovery of King Tut, opening in New York on Nov. 21. With precisely crafted replicas and reconstructions, the exhibit allows visitors to step into exact recreations of three burial chambers just as the discoverers saw them. 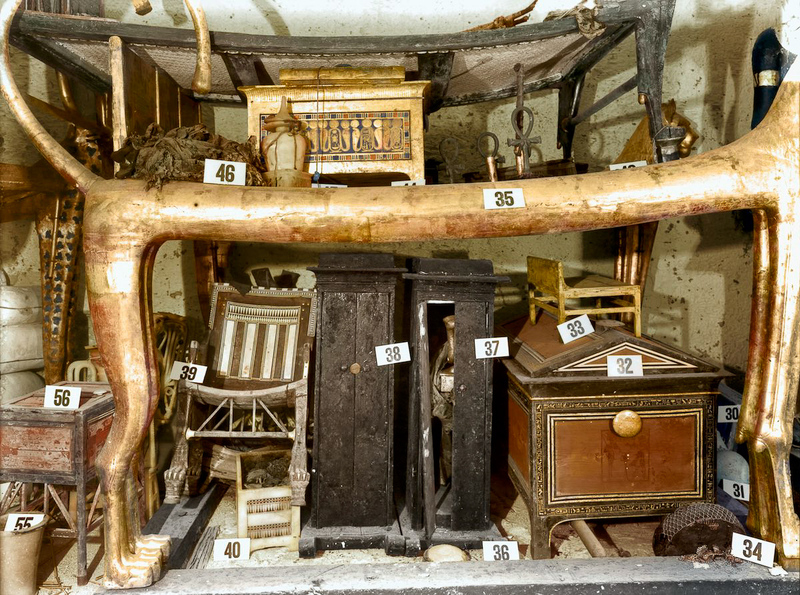 A gilded lion bed, clothes chest and other objects in the antechamber. The wall of the burial chamber is guarded by statues. 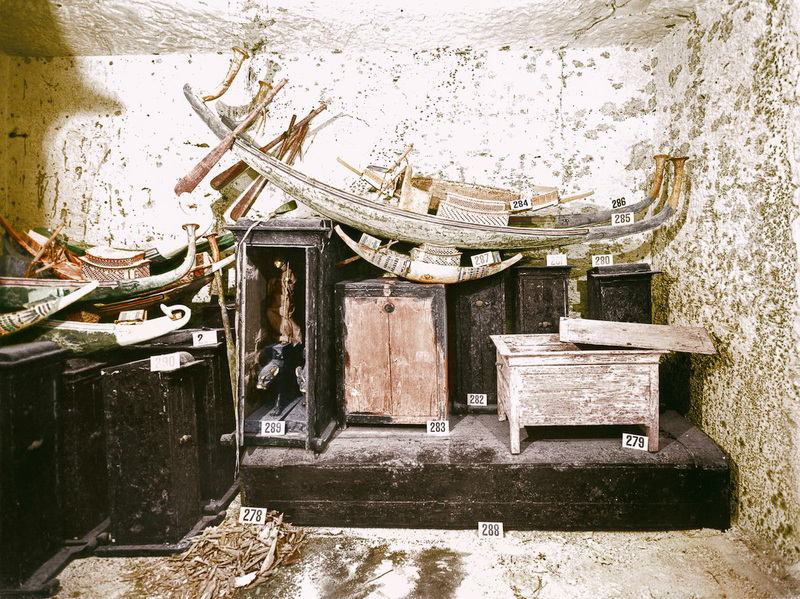 An assortment of model boats in the treasury of the tomb. 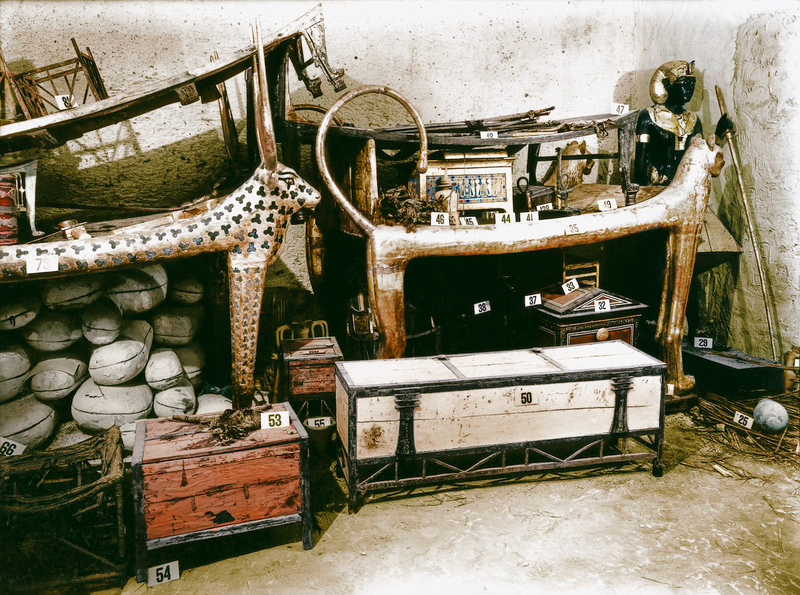 A gilded lion bed and inlaid clothes chest among other objects in the antechamber. 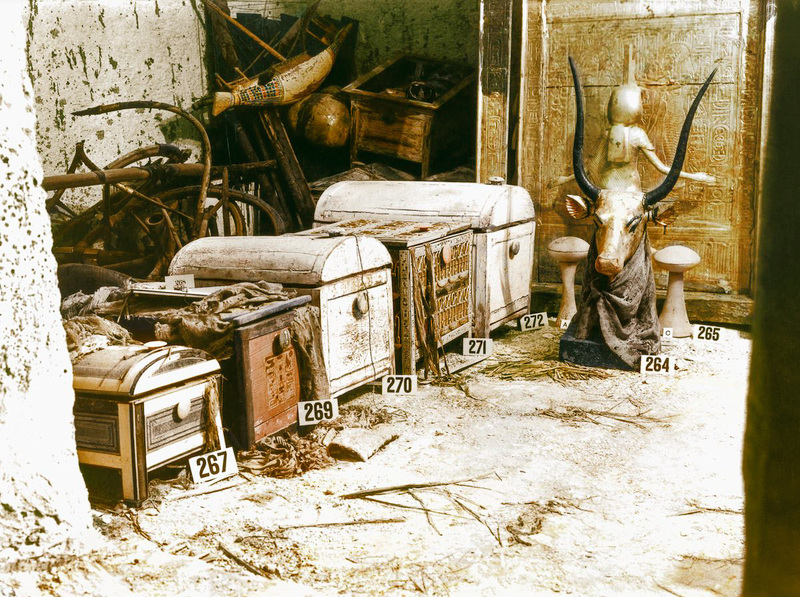 Under the lion bed in the antechamber are several boxes and chests, and an ebony and ivory chair which Tutankhamun used as a child. A gilded bust of the Celestial Cow Mehet-Weret and chests sit in the treasury of the tomb. Ornately carved alabaster vases in the antechamber. 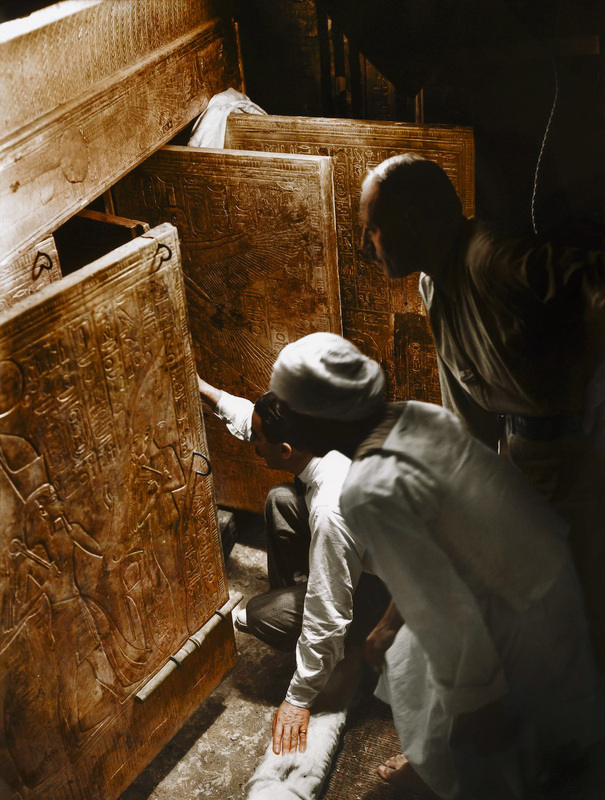 In a “laboratory” set up in the tomb of Sethos II, conservators Arthur Mace and Alfred Lucas clean one of the sentinel statues from the antechamber. 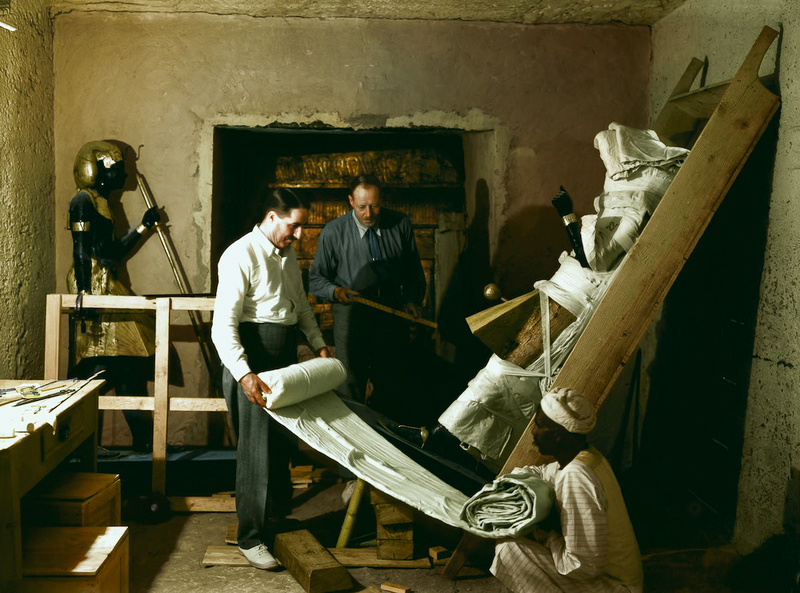 Howard Carter, Arthur Callender and an Egyptian worker wrap one of the sentinel statues for transport. 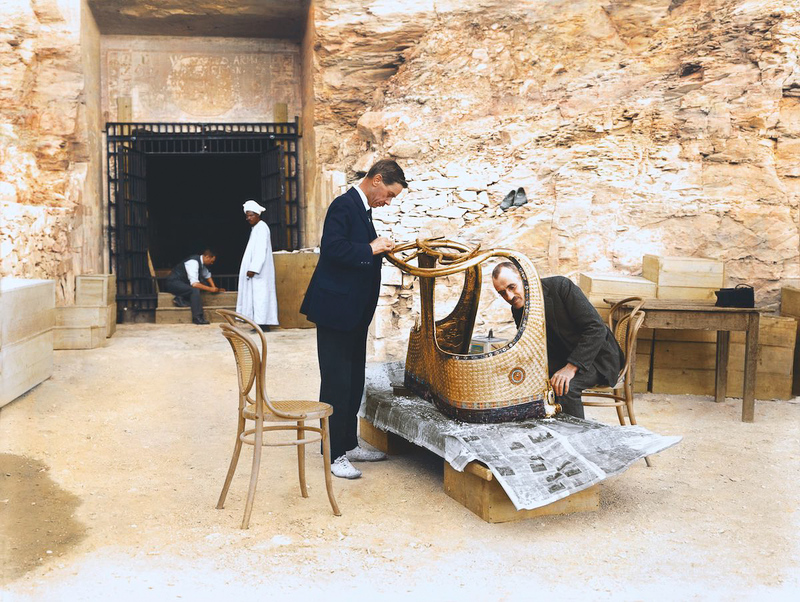 Arthur Mace and Alfred Lucas work on a golden chariot from Tutankhamun’s tomb outside the “laboratory” in the tomb of Sethos II. A statue of Anubis on a shrine with pallbearers’ poles in the treasury of the tomb. 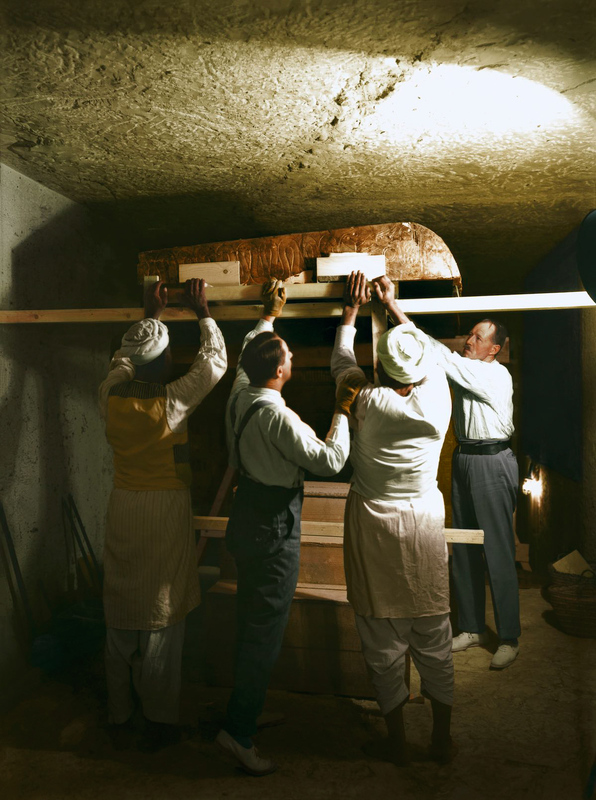 Carter, Callende, and two workers remove the partition wall between the antechamber and the burial chamber. 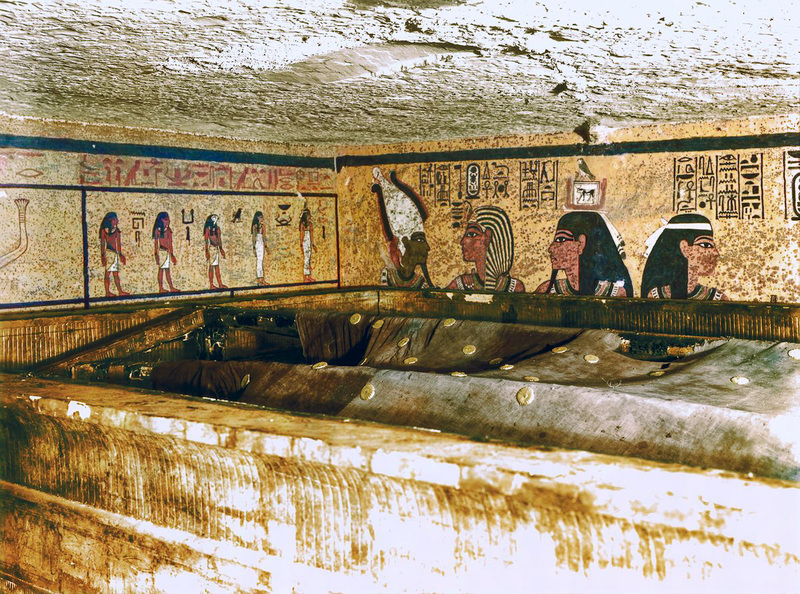 Inside the outermost shrine in the burial chamber, a huge linen pall with gold rosettes, reminiscent of the night sky, covers the smaller shrines within. Carter, Mace and an Egyptian worker carefully roll up the linen pall covering the second shrine. 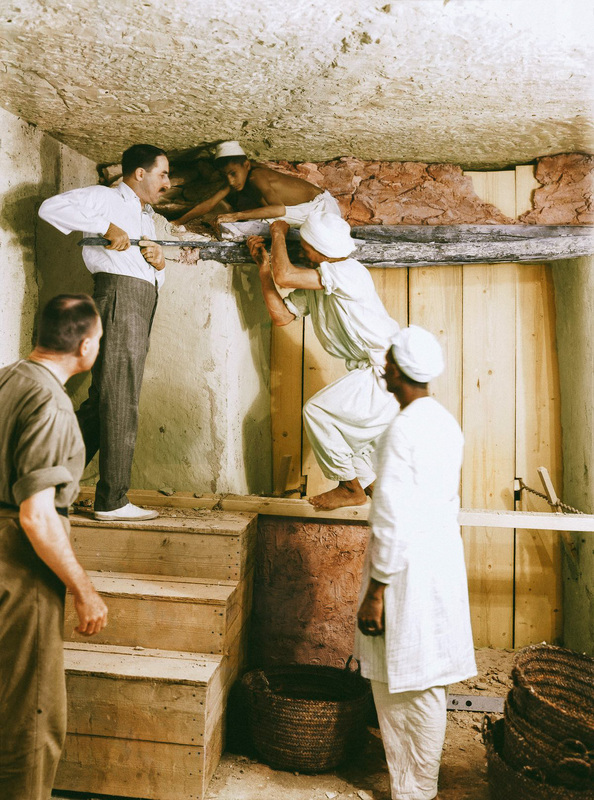 Carter, Callender and two Egyptian workers carefully dismantle one of the golden shrines within the burial chamber. 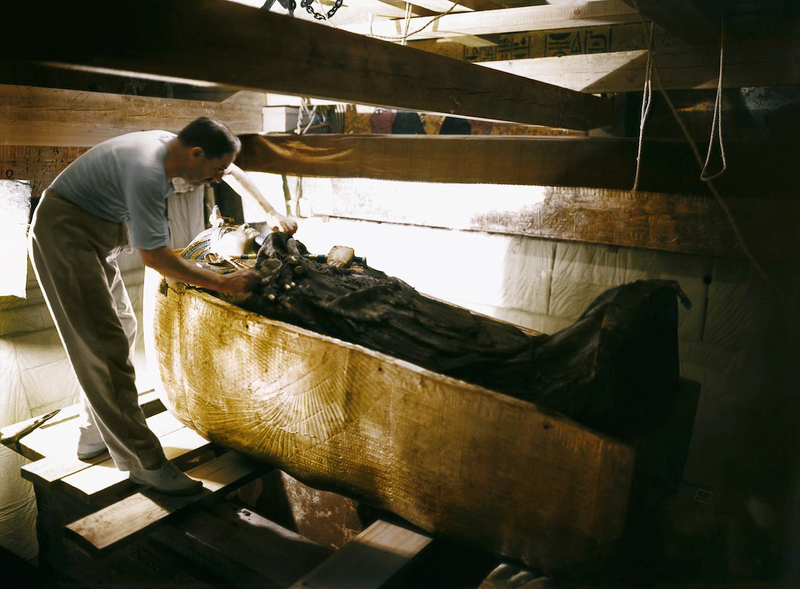 Carter and a worker examine the solid gold innermost sarcophagus. 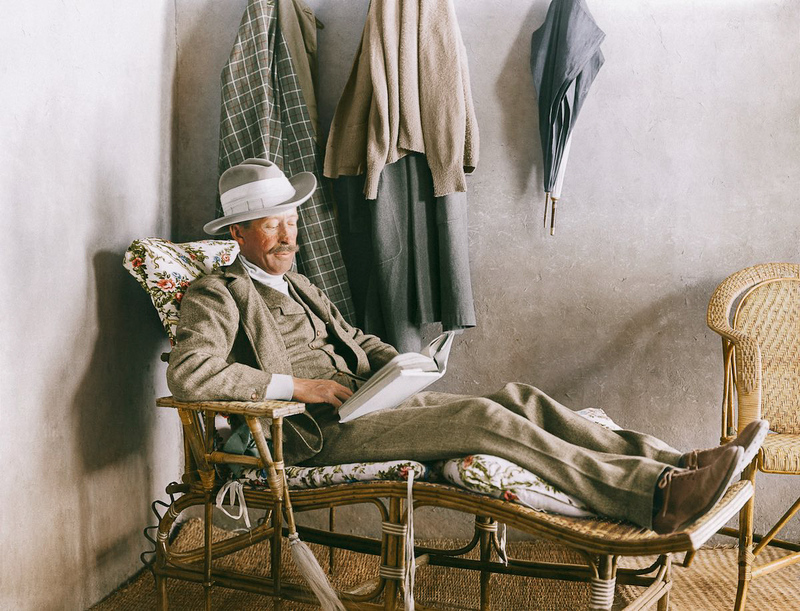 Lord Carnarvon, financier of the excavation, reads on the veranda of Carter’s house near the Valley of the Kings. Ancient Egyptians, Grand Canyon This Egyptian Tunnel City was named Kincaids Cave for G.E. Kincaid who first entered the Cave when he was working for S. A. Jordan. FBI Agents now guard Kincaids Cave and other Archaeological Sites in the Grand Canyon. G. E Kincaid served in the Marine Corp. After retiring he worked for S. A. Jordan as a Acchaelogist. S. A Jordan was sent to the Grand Canyon by the Smithsonian Institute to investigate the information that was reported by John Westly Powell. The Tunnel is presently on Cliff Wall 395 feet above the present flow of Colorado River in the Grand Canyon. Archaelogist estamate the Man Made Cavern is around 3,000 years old. The Man made Cavern is over Five Hundred feet long and has several cross Tunnels to large Chambers. This was the lowest level and last Egyptian Tunnel City they built in the Grand Canyon. Since the time that this Egyptian Tunnel City was made, Archaelogist estimate the Colorado River has eroded another 300 feet lower. This is a Gold Artifact for the Egyptian King named Khyan, Khian or Khayan was found in the Egyptian Tunnel City in the Grand Canyon that was named Kincaids Cave. The Egyptian Shrine is holding Egyptian Lotus Flowers in both Hands. Lotus Flowers originated as Native Flowers in Egypt. The Egyptian Shrine was in the first cross Tunnel in the Tunnel which was in the exacatly the same location that the Shrines were in the Valley of the Kings Tunnel Cities were Egyptian Kings lived, before the Kings of Ancient Egypt begain to build Pyramids and above gound Cities in Egypt. means Khyan, Khian or Khayan was a powerfull King in Egypt. Khyan, Khian or Khayan was recorded as a Decendent of Zaphnath or (Joseph) that was the King of Egypt from 1610 to 1580 at Avaris Egypt where King Zatnnath ruled Egypt from also. All Kings and Pharaoh’s had different Egyptian Hieroglyphs for symbol identification. Both the Symbol and name of Khyan is on the base of his Shrine. The top symbol on the the Base of his Shrine in the left side top of his center Hieroglyph is the Hebrew Semitic Son of the Right Hand that meant first born Son. Then in the Center of the Base is the Hieroglyphic symbol for Khyan with his power beams and he is holding the Staff of the Lord in one Hand. There is no doubt about the identification for Khyan or that he was a decendent of King Zaphnath in Egypt who was ( Joseph ) in the Bible. King Kyan sat on the Throne of his Ancester King Zaphnath at Aravis Egypt also. This Artifact was from Kincaids Tunnel. Even though the many large other smaller Images were found in the Tunnel in the Grand Canyon, this Artifact was a important discovery for Smithsonian Archaelogist. It is a Artifact is for King Akhenaten and Queen Nefertli. Their Ancester’s and Children’s names are on the Artifact. The Egyptian name of Zoroaster or (Joseph) is one of their Ancesters. It is recorded that Akhenaten restored the Semitic Religion of Amon in Egypt at Saqqare Egypt. Akhenaten was the recorded Ruler in Egypt from 1353 to 1336 BC. His son Seteprene was also a Egyptian Ruler in the Grand Canyon and was recorded as a King at Saqqara Egypt also. This Egyptian information means that Egyptian Kings came to the Grand Canyon at various times but also made return trips to Egypt. These Gold Artifacts from Kincaid Tunnel are the only Artifacts on display in the Smithsonian Institute at Washington DC. from the Grand Canyon. The back Two Artifacts are for Artifact King Akhenaten and Queen Nefertli. This Artifact is from Kincaids Tunnel in thr Grand Canyon. This Artifact found in the Egyptian Tunnel City in the Grand Canyou was identified as being a Artifact for King Aperanat who sat at Saqqara Egypt also. In Egypt, King Aperanat was known as the powerfull King that Ruled Foreigners also. This Copper Statue in Kincaids Tunnel in the Grand Canyon was identified as a Shrine for Anubis. It is impossable that he was ever in the Grand Canyon. Anubis was a famous Egyptian Embalmer that beleived in a after life. This Pyramid Temple was named the Zoroaster Temple. The original Seth Tanner Trail is still a popular Tourist Trail in the Grand Canyon. The Egyptians Mined Copper, Silver, and Gold from the Grand Canyon. There are many Ruins of Egyptian Metal Smelters and Furnaces in the Grand Canyon. These Metal Smelters and Furnaces are located on the Second Plataeu of the Grand Canyon and there are several Mining Tunnels and Egyptian Tunnel Cities in the Cliff Walls of Second level Grand Canyon Plataue. Even though the Iris Temple in the Grand Canyon is now badly eroded, a few of of the Ancient Egypyian Hieroglophs can still be seen on the Cliff Walls of the Temple. The Temple also has a obvious Entrance, but only a few feet into the Temple the Entrance is closed. The National Park Service will not allow any excavations of the Pyramid Temples. This small Gold Artifact was found in Kincaids Tunnel. This Artifact for Iris in currently on display in the Smithsonian Institute at Wagington DC. She was the First Daughter of Gad, who was the first God of Earth in Egypt. Her Heart was full of love. The Hearts of her Love are on the Base of this Image of her. This Gold Artifact from Kincaids Tunnel is for Amaunet the Secret One. Another Artifact forAmaunet the the Secret One and Gad was found in Burroew Cave in Illinois. Amaunet laid a big Egg that shined like Gold. This was the first Sun light in Egypt. The Egg was big because there was a Twin Boy and Girl in it. Then Amaunet saw that she had Wings and flew from the Heavens to Egypt and then everybody in Egypt knew who Amaunet was and Amaunet was no longer Amaunet the Secret One. The Hopi Indians told Grand Canyon Park Rangers that this was the Tower of Ra. The Egyptians Built some large Entertainment Centers in the Grand Canyon. The Buildings had Wood Roofs that are no longer on the Buildings. These Entertainment Centers had large Feilds for Foot Races and Games and had Shower Rooms and Homes for the Different Athelete Teams. The centers also had large Theaters for Musical Concets and Kitchens to prepare Meals for the Egyptian Kings, Atheletes, and Musicians. The Mummies were placed in the Burial Chamber Walls on large Stone Blocks. The Egyptians begain coming to the Grand Canyon according to the Carbon Dating of the Mummies Bones. The Carbon Date for the oldest Mummie was around 1600 BC. Prime Minister Nubar Pasha of Egypt was first Prime Minister of Egypt and served his first Term from January 1884 to June 1888. Prime Minister Nubar Pasha of Egypt contact the US Department of State and requested that all of the Egyptian Artifacts found in the Grand Canyon to be returned to Egypt. https://www.google.com/ John Westly Powell is talking to a native named Jacob Vernon Hamblin in the Grand Canyon who was a Mormon and spoke English in this Picture of John Westly Powell and Jacob Vernon Hamblin that was took in 1869 . The Native knew the he was of Egyptian, European, and Hopi Indian decent. John Westly Powell lived in the Town of Green River in Emery County, Utah. US Department of the Interior and came down the Green River to explore the Grand Canyon. John Westly Powell was the first Person to report any Archaeological information to the US Government about the Natives that inhabited Grand Canyon and their Histories. Powell served as second director of the US Geological Survey Department (1881–1894) a Division of the US Department of the Interior. John Westly Powell was also Director of the Bureau of Ethnology at the Smithsonian Institution, and supported Linguistic and Sociological Research and Smithsonian Institution Publications of Discoveries and Researched Information. The John Westly Powell River History Museum is located in Green River, Utah. John Westly Powell had previously reported the Pyramids in Wisconsin and along the Mississippi River to the US Department of the Interior. The John Westly Powell River History Museum has all of his information of his discoveries including the Bones of a Dinosaur that he discovered that has been erected in the Museum. This Picture is the entrance to Powells Cave in the Grand Canyon. John Westly Powell wrote in his report to the Government which he also Published in a Book. In this Canyon, great numbers of Man made Caves are hollowed out. I first walked down a gorge to the left of a Cliff and climbed to a Bench of the Cliff. There was a Trail on the Cliff Bench that was deeply worn into the Rock Formation. Where the Trail crossed some Gulches some Steps had been cut. I could see no evidence that the Trail had been traveled in a long time. I returned to our Camp about 3:00 PM and and the men had found more Egyptian Hieroglyphics on Cliff Walls near the Cave. This Shrine is in Powells Cave. He is holding a Egyptian Lotus Flower in one Hand. John Westly Powell wrote, we explored the Cave and found this Shrine and other Artifacts. That evening I sent a team member to notifie the Smithsonian Institute of our discovery. We contuined to Survey the Canyon and discovered more Egyptian Tunnel Cities. I estimate in my Report that I think that upwards of 50,000 Egyptians had inhabited the Grand Canyon at one time. This Shrine in Powells Cave was identified as a Shrine for Seteprene sometimes spelledSmenkhare Seti or Smenkare. King Seteprene was King Akhenaten’s Son that begain his Rule at Saqqara , Shemau in 1336 BC but only lasted 10 Years which was when he died on his last trip from the Grand Canyon to Saqqara Egypt. This may be the reason that his Shrine was not ever covered with a hammered Gold Sheet of thin Gold. The Egyptian Urnes found in Powells Cave in the Grand Canyon are now on display at the Smithsonian Institute at Washington DC. This Diagram was a important discovery for the Smithtonian Archaelogist who were exploring the Powells Tunnel in the Grand Canyon. This is a Diagram for Egyptian Writing System when the Ancient Egyptians came to the Grand Canyon. It was a School Tablet used for teaching Egyptian Children to Read and Write. The Animal and Bird Symbols were used to describe the Ranks of the Kings on the Egyptian Hieroglyphs carved into the Cliff Walls of the Grand Canyon. It is interesting to note the Rectangle Box on the top 2nd Row from the left is the Hebrew Ark of the Covenents symbol. And then lower in the same Row is the Box without a bottom which was the Hebrew Son of the Right Hand symbol. When the Egyptians came to the Grand Canyon around 1700 BC they begain building Tunnel Cities in the Vermillion Cliff Walls into the North Rim of the Grand Canyon. The Egyptians first selected overhangs that had Balconies so the Kings could walk to edge of the Plataeu Balconies and look at the Farming and Mining that was located at lower levels of the Grand Canyon. The Egyptian Kings had their Egyptian Hieroglyphic Symbols and other Hieroglyphic Symbols on the Canyon Walls around their Tunnel Cities and on the Grand Canyon Cliff Walls. The Kiabab Plataeu is around 8,000 feet above the present flow of the Colorado River in the Grand Grand Canyon. These Cliff Walls were the Top Cliff Walls that were above the large Kiabab Plataeu of the Grand Canyon. All of the Egyptgian Temples are are on the North side of the Grand Canyon also. The Kiabab Plataeu of the Grand Canyon. In Areas of the Plataeu Water slowly seeps into the open Grass Meadow Lands to keep the Fertile Soil Moist. We have estimated that it would be easy to Grow enough Food in the Moist Grass Lands to feed at least 500,000 People. The estimate for the Number of Egyptians that were in the Grand Canyon was 10,000 People. It is likely that whatever extra Food that was grown in the Kiabab Plataue was exported to Egypt. The Walhalla Ruins. These Ruins in the Kaibab Plataeu of the Grand Canyon are being Excavated. FBI Agents attend Excavating Teams in the Grand Canyon and now at all Sites in the United States. Grand Canyon National Park was named an official National Park in 1919. The National Park Service has a Policy of preserving the History of Native American Indians when establishing Parks. They lived on the North Kiabab Rim of the Grand Canyon where the Egyptian Pyramids are located. And they knew the names of the Egyptian Pyramid Temple names that are located under the North Kiabab Rim of the Grand Canyon. The Hopi Indians have a God named Taawa. He has a Mans Face that smiles all of the time and has a good Heart. The Hopi Indians still use a large number of original Egyptian words in their Language. Seth Tanner a Morman who lived in the Grand Canyon with the Hopi Indians was the translator to The National Park Service Researchers for the Hopi Indians. He had two Hopi Indian wives. He said the Hopi Indians were Morman Christians that called themselves the People of One Heart. He was their Pastor and was also a Farmer. The Tower of Set, actualy the ( Seteprene ) Pryamid was named by the Hopi Indians. The Tower of Set, was be built in the Grand Canyon as a burial Tomb for King Seteprene that came to the Grand Canyon. 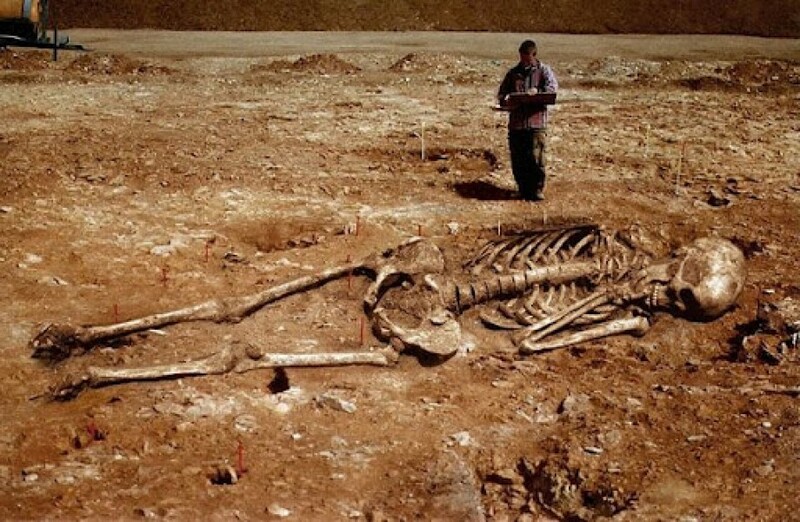 But King Seteprene died on a Trip back to Shemau. All of the Egyptian Hiegroglyphs have eroded off of the Pyramid. The Set Pyramid has Rectangle Shape simular to the first Pyramids in Egypt. Zoroaster Temple in the Grand Canyon was named by Hopi Indians. Zoroaster was in Egypt when times were hard and Egypt had become a Poor Nation. But Zoroasters first name had been ( Joseph ) because he had a God that was higher in the Heavens than their Sun God named Ra that knew what the dream meant. He built a big Boat that had Wings (Sails) that would carry many People and found more Grain and Gold for the Egyptians. And Pharoah was like a Father to King Zoroaster. The Smithsonian Archaelogist think that that this unfinished Egyptian Pyramid in the Grand Canyon is a burial Tomb because there is a entrance Tunnel that is blocked a few feet inside the Pyramid.. But the National Park Sevrice will not allow the Archaeologist to excavate any of the Pyramids in the Grand Canyon. One of Crips was opened in the Grand Canyon to see if there were Mummies in them before they were sent to the Smithsonian Institute Storage Building. 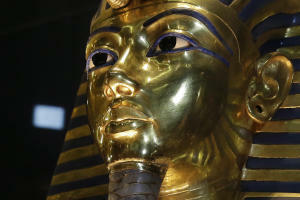 Official says Egypt approves radar for Nefertiti tomb quest…..
CAIRO (AP) — The Egyptian Antiquities Ministry granted preliminary approval for the use of a non-invasive radar to verify a theory that Queen Nefertiti’s crypt may be hidden behind King Tutankhamun’s 3,300-year-old tomb in the famous Valley of the Kings, a ministry official said Tuesday. A security clearance for the radar’s use will probably be obtained within a month, said Mouchira Moussa, media consultant to Antiquities Minister Mamdouh el-Damaty. “It’s not going to cause any damage to the monument,” Moussa said. Egyptologist Nicholas Reeves recently published his theory, but it has yet to be peer-reviewed. He believes that Tutankhamun, who died at the age of 19, may have been rushed into an outer chamber of what was originally the tomb of Nefertiti, which has never been found. 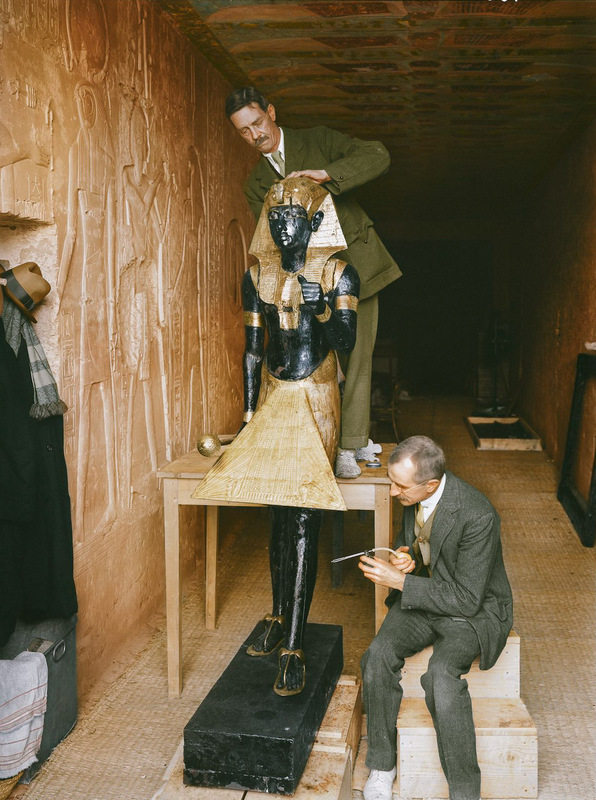 British archaeologist Howard Carter discovered Tut’s tomb in Luxor’s Valley of the Kings in 1922 — intact and packed with antiquities including Tut’s world-famous golden mask. 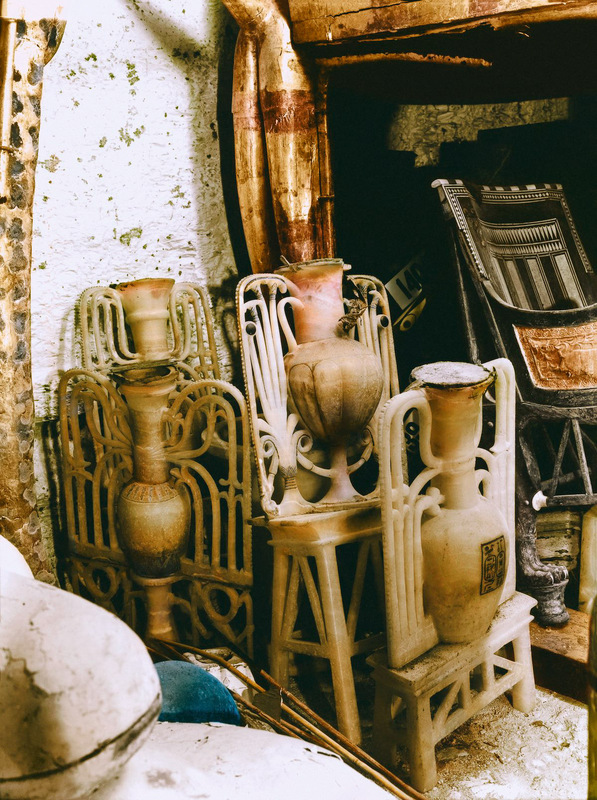 In his paper, Reeves claims high-resolution images of King Tut’s tomb include lines underneath plastered surfaces of painted walls, showing there could be two unexplored doorways, one of which could potentially lead to Nefertiti’s tomb. He also argues that the design of King Tut’s tomb suggests it was built for a queen, rather than a king. The Japanese radar, which will be operated by an expert who will accompany the equipment from Japan for the inspection once the final approval is granted, will look beyond the walls that Reeves says may be leading into the suspected tomb and the other chamber, Moussa said. Reeves, who has been in contact with the minister, arrives in Cairo Saturday, Moussa said, and he and el-Damaty will travel to Luxor to inspect the tomb. Already, there’s a mummy at the Egyptian Museum in Cairo that has strong DNA evidence of being Tut’s mother. DNA testing also has provided strong evidence suggesting that Tut’s father likely was the Pharaoh Akhenaten, the first pharaoh to try switching Egypt to monotheism. The DNA testing also brought a new discovery: that Tut’s mother was Akhenaten’s sister. Still, some archaeologists believe the two were probably cousins and that this DNA result could be the product of three generations of marriages between first cousins — and that Nefertiti, Akhenaten’s chief wife, may in fact have been Tut’s mother. Many Egyptologists believe there were probably one or two co-pharaohs between Akhenaten and Tutankhamun. Some, including Reeves, believe at least one of them may have been Nefertiti, who may have even ruled Egypt by herself even for just a few months. Finding her tomb could provide further insight into a period still largely obscured, despite intense worldwide interest in ancient Egypt.